What is Osteopathic Manipulation or OMT? Osteopathic manipulative treatment, or OMT, is a hands-on treatment where Osteopathic Physicians, or DO’s, use their hands to examine the all parts of the body such as the back, neck, joints, tendons, ligaments, and muscles, for pain and restriction during motion that could signal an injury or impaired function. As an osteopath, an osteopathic physiatrist, and a certified massage therapist, Dr. Whitaker has a unique background in both complimentary medicine and traditional treatments for musculoskeletal conditions. Whenever possible, his philosophy is to work from the least invasive and least expensive treatment options to more invasive options. That is why he loves serving the Boise, Idaho, area and having the ability to perform osteopathic manipulative medicine treatments for a wide variety of conditions. Dr. Whitaker treats newborn babies to seniors. Click HERE to learn more about Dr Whitaker. He received his training from the founding osteopathic medical school (A.T. Still University – Kirksville College of Osteopathic Medicine), an osteopathic manipulative fellowship, his physiatry residency and many extra courses. 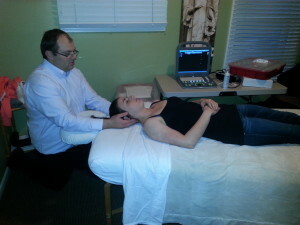 He has had extra training and experience with manipulation for pregnancy related pain, headaches, those suffering from cystic fibrosis, and new born babies. Dr. Whitaker has also been trained to use manipulation for spine pain and extremity problems. Performing manipulation in conjunction with an individualized home exercise program, and if needed medication or injection therapy, is a powerful combination. Dr. Whitaker also assess your posture and bio-mechanics in order to develop a program that will help you get the results that you are seeking. Osteopathic manipulation provides relief from the aches and pains that many people experience and can help to avoid costly, addictive pain medications. Contact Idaho Joint and Spine today to schedule an appointment or to inquire more about OMT!